Henri Matisse’s illustrated book Jazz (1947) is one of the most famous graphic works and arguably one of the best loved artworks of the 20th century. In Matisse’s first major ‘cut-out’ project, realism and abstraction are finally reconciled at the end of a life-long tension. With the cut-out technique, Matisse felt he had finally solved the problems of form and space, outline and colour. ‘It is not a beginning, it is an endpoint’, the artist stated. Jazz comprises a set of 20 vivid colour stencils and over 70 pages of Matisse’s calligraphic writing. 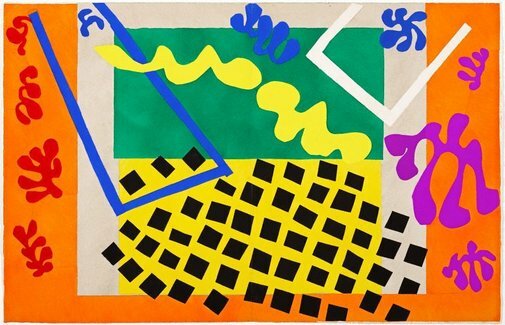 Jazz was pivotal in Matisse’s transition from oil painting to the cut-out collages that dominated the last decade of his life. To create these works, Matisse cut forms out of large sheets of paper previously painted with gouache by his assistants. The cut-outs were then assembled on the wall of Matisse’s studio, under his direction. The compositions selected for Jazz were entrusted to the colour specialist Edmond Vairel to be turned into stencils. These were then printed with the same vivid gouaches used by Matisse. The cover and manuscript pages were printed separately by Draeger Frères in Paris. Jazz was published by Tériade in an edition of 250. The book’s title evokes the idea of a musical structure of rhythm and repetition, expressed through the handwritten text, which is broken by the explosive improvisations of the colour plates. Matisse’s subjects are taken largely from the circus, mythology and memories of his travels. They represent either isolated figures or paired forms that suggest a dialogue between artist and model. Despite the vivid colours and folkloric themes, few of the plates are actually cheerful. Several are among Matisse’s most ominous images. 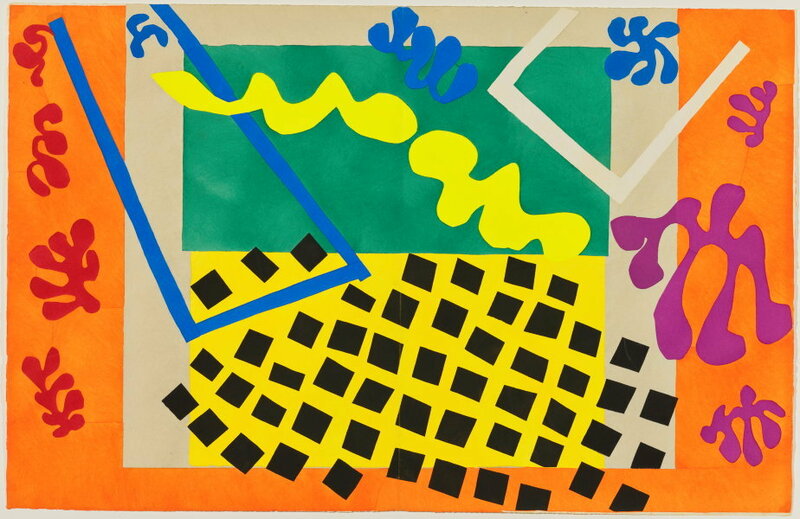 The writing of Jazz was very important for Matisse and though the pictures were mostly finished by 1944, he continued to work on the text until shortly before the book was published in September 1947. While the text gives the impression of great spontaneity, it was written out four or five times until Matisse was satisfied with the manner of expression and size of handwriting. Matisse stated that his manuscript pages represent merely a visual accompaniment to the plates and ‘their role [was] thus purely spectacular’. Despite Matisse’s claim, the text and plates are actually subtly and consciously related. The underlying themes of art and artifice find many parallels in the text. Jazz represents one of Matisse’s most interesting statements about his artistic development and the act of creation, which he believed results from the synthesis of instinct and intellect guided by discipline. From the edition of 250, published by Tériade Editions with 20 pochoirs executed by Edmond Vairel and the text printed by Draeger Frères. Signed on the justification page. There was also an edition of 100, the so-called portfolio edition, and 20 hors commerce copies. Claude Duthuit, Henri Matisse. Catalogue raisonné des ouvrages illustrés établi avec la collaboration de Françoise Garnaud , Paris, 1988, pp 160–61, no 22. Anne Gérard-Austin, Look , 'Drawing with scissors', Sydney, Jun 2015, pp 24–28, col illus p 26. illustrations on cover page and pp 7, 24–25, 26, 27, 28. Unknown, ‘Matisse ‘Jazz’ from bookshelf to gallery wall’, Sydney morning herald, no 55329 , Sydney, 10 Feb 2015, p 22, col illus p 22. Prints & multiples, Tuesday 29 October and Wednesday 30 October 2013, auction cat, Christie's New York , New York, 29 Oct 2013, pp 106–07, lot 133.